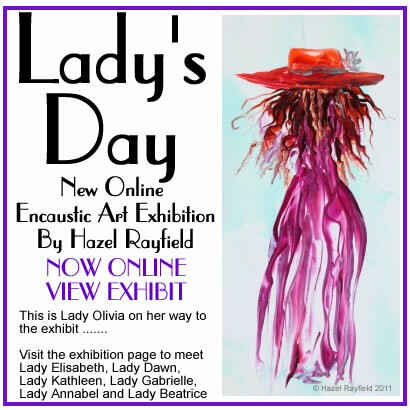 I have today uploaded a new exhibition to the Art In Wax exhibits page on the website. I have for a while been wondering what subject to choose and it just came to me and I thought I would roll with it …… it may seem a bit of a whim but why not and I have had great fun painting this new project. The new exhibition has a collection of six paintings approximately 12 x 8, each of a Lady dressed in her finery, “Posh Frocks and Hats”. I imagine they are attending, an event; a “Day at the Races” perhaps, or a “Charity Ball” maybe? One of the beauties of working with wax it has a wonderful texture and sheen that can be created, I have let my imagination run wild with this collection, and it has been fun experimenting with layers of wax and colours. The paintings are a whim, they are fun, and are not to be taken too seriously, just enjoyed and smiled at maybe! Thank you to my husband Adrian for taking the photos and making the paintings looks great in digital format. Please have a look at the exhibit and if you would like to leave a comment, please do so below.